The Lower Garden District’s Gallery hosted an April Fools Pop Up Shop on Saturday. Arts and crafts, fashion accessories, poetry performances, tarot card readings, and more featured local and some Texas artists. From 10 am to 6 pm guests were able to enjoy Bloody Marys and mimosas with proceeds donated to charities. At 1906 Magazine Street in the Lower Garden District, The Tasting Room offered leisure hour specials from 3 pm to 7 pm. Guests enjoyed $5 glasses of select wines and $20 wine flights throughout the evening. In the courtyard, a special April Fools showing of The Three Stooges played on a projector while guests dined and sipped on brews from NOLA Brewing Co. and new beers from Gnarly Barley Brewing. Preparing for the run up to April Fools Day, Loyola University hosted its third annual fools fest called the Loyola Family Fair on March 25th. The free event was open to members and partners of the Loyola network. This year, the festival–run by students–took an exclusive focus on the entire Loyola community and their families. From 11am to 7pm, ten bands featuring students and alumni from the Film and Music Industry Studies Program and Loyola’s music program took the stage. Guests enjoyed field day and carnival games, a craft fair, international foods, and other family-friendly activities. Although April Fools is about lighthearted jokes, this event was held in tribute to the community and faculty members that support the student body throughout the year. Celebrating April Fools with a laugh, guests enjoyed shows at The New Movement Theater in the Bywater section of NOLA. Go Ahead from 7:30 to 8:30 pm featured alternative comics for an hour of humor. Living Room Liars performed an interactive improv showing of “Who’s Telling the Truth?”Affordable $5 tickets made this a show where you could truly enjoy the comedy relief without worrying about your wallet. If you missed the shenanigans this April Fools, enjoy a laugh at upcoming shows at The New Movement Theater. As far as evening drinks, there is no shortage in NOLA. You can find fantastic happy hour specials at bars like Altamura, Trinity, or even the Dryades Public Market. 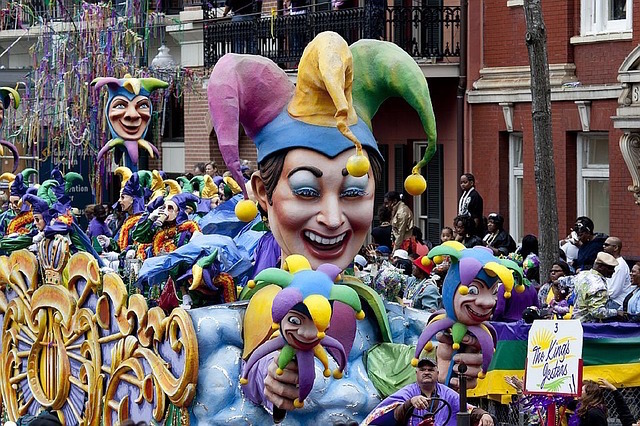 If there’s anywhere to enjoy your inner prankster, its New Orleans!